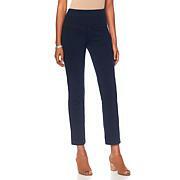 Pull on flattering, effortless style and comfort when wearing this versatile stretch denim pant. Its versatility provides a seasonless and regionally-chic look that takes you from sunrise to sunset. Add a top that's oversized for luxury or a more fitted silhouette for sophisticated style. 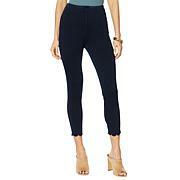 I love Lysse leggings, and as such, I tried these. These are my new favs. They have a slight boot-cut that looks great with boots, heels, wedges, etc., and are extremely flattering on my body. While I typically need a 28" inseam,the 30" works. I'm 5'4", and bought the XL (I typically wear a L, but go up a size to avoid the "sausage" look!) They wash well, (inside out, cold water, Woolite for darks), and I do put them in the dryer. I now have two pairs of each color, and will get more. I have several Lysse leggings and thought I'd give these a try after watching the on air presentation. The pants fit great and are not tight on the thighs and calves so I don't have to wear a tunic top like I do with the leggings. I think they run a little long (but I'm only 5'3"); they are made well and a very good quality. When I ordered this item the title stated it was a "trouser" OK they changed it to pant. I assumed that the legs would be straight and have some extra room. I have muscular thighs and calves these fit me like a legging. Extremely disappointed with these.